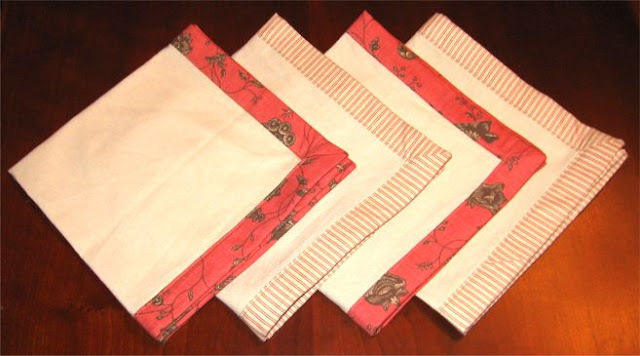 Well my goal for Thanksgiving was to make 8 napkins and a table topper to match my Rouenneries quilt. It seemed like a reasonable goal but I only managed to get 4 napkins made. I guess there's always next year: ) For these I used Essex Linen fat quarters with wide french-fold binding around the edges. They're awfuly fiddly to make and each one took about an hour which seems like a lot of work for a napkin. I think I'll prep the rest and sew them when I'm stuck on other projects. No telling when I'll get the table topper quilted.